Imogen's Typewriter. 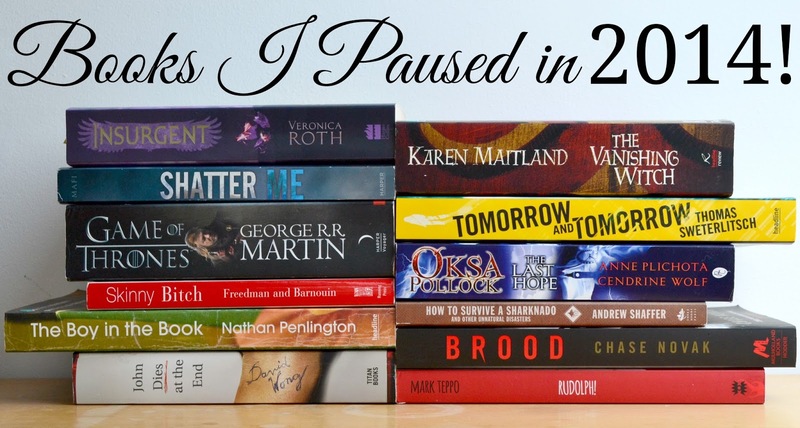 : Books I 'Paused' in 2014! Books I 'Paused' in 2014! My 'Paused' shelf on Goodreads is kind of my version of a did not finish shelf, but less permanent because I feel like some of these books I might pick up again. I paused 14 books in 2014; some because I wasn't enjoying them, some because I just wasn't feeling them at that time and some because I just felt like reading something else. I thought it would be interesting to have a look back at why and see which ones might be un-paused this year as part of my reading goal to finish at least one of these books! So in order of pausing.. I read Divergent and moved onto this, the second book in the series, but I wasn't emotionally invested enough in the series to spend more time on these books. I got 256 pages in and I was done. And I really couldn't read another kissing scene if I'm honest! Oh Shatter Me. I bought this book for a Buddy Read and this has one of the most beautiful book covers I've ever seen but the writing and the story just weren't for me and I was gutted. Lianne didn't get on with it either but I always see people rave about it and wish I liked it. I read a good amount of this book, 186 pages and more than enough for me to get into the story but my main problem with it was how close it was to the TV show, I'm a fan of the show so it just felt like I was reading what I had already seen with some very small changes. Another problem I had with it, and something I notice a lot in epic fantasy books was the amount of- unnecessary detail. One part sticks out to me when I think of this and it was a scene where Lady Stark asks for a basic breakfast of this and that and is presented with a big breakfast with a long list of what was on the plate. I just- didn't care and I feel there were a lot of moments where I could have lived without some of the detail. This isn't pictured because I have it in e-book form and can't really remember much about it. I'm just not an e-book fan and wasn't so impressed with the story enough to go and buy a physical copy. I liked this book. I really liked this book. Until it started tipping into stalking and the whole obsession that the author had with the guy he was looking for got a little creepy. To the point where the subject of the obsession could probably use the book as evidence to get a restraining order. I'm hoping there's a turning point and a happy ending but I had to put this book down after a while. I got half way through this book and just felt like I wasn't quite the audience the author was after. It all felt a little teenage boy. Don't get me wrong, I can see why people like the book, it's one of my brothers favourites and I think he has decent enough taste but for me, I got half-way through this book and just didn't care enough to continue or even google what happened to the characters. It's been 8+ months and I have felt no urge to pick this book up again. For me, I liked this book well enough but it was just taking a long time for anything to happen. In fact, I was about 150 pages in before the thing mentioned in the blurb actually happened and at the time I just wasn't feeling it. I do think I'll probably pick this up again though because Karen Maitland's writing was really lovely. I didn't really give this much of a try if I'm honest, I started it on holiday and it just didn't grab my attention at all. I'll get around to it one day! I spoke about how much I was looking forward to this book in this blog post but I just found there was too much going on for me to keep up with it. The writing was so busy with all the different aspects of the world that it slowed down the story too much for me. This is one I will probably pick up again in 2015 as the only reason I put it down was that at the time I wasn't feeling a middle grade book. Next time I'm in a book hangover, this is getting pulled off the shelf. This came in my October Loot Crate and I started it on Halloween only to struggle through half of it over a couple of weeks before giving up. It's not that I'm unfamiliar with the format, it's similar to The Worst-Case Scenario Survival Handbook which I own along with the Life version , University version and I even got the calendar for Christmas last year but the writing just wasn't for me and I feel you'd have to have seen a lot of the awful disaster movies to make heads or tails of half the references. I read this without reading the first book in the series but considering the time difference, I didn't think it was that important. There was enough backstory to skip the first book but not enough current story to keep me interested. The characters were very- flat. I'm not sure I'll come back to this one. I started reading this around Christmas for obvious reasons but I had so many other Christmas books I wanted to get to that since I wasn't really enjoying this one too much, I just put it down. I'll try it again next December! I do think it's important to mention that I don't think any of these are 'bad' books. I just think some of them weren't for me and I hope nobody is upset if their favourite book ends up on my paused shelf! Do you have a paused/ did not finish shelf? What books are on it? *I received these books for review. It has not changed my opinion on them and I'm not obligated to talk about them. ** I won this book from Goodreads. 30 Before 30: One Year On! 5 Reading Goals for 2015! Loot Crate: December 2014: Anniversary!